Whilst Gilbert & Sullivan's operas have remained popular with fringe companies, audiences and non-professional performers, not so long ago productions by professional opera companies were rather rare. 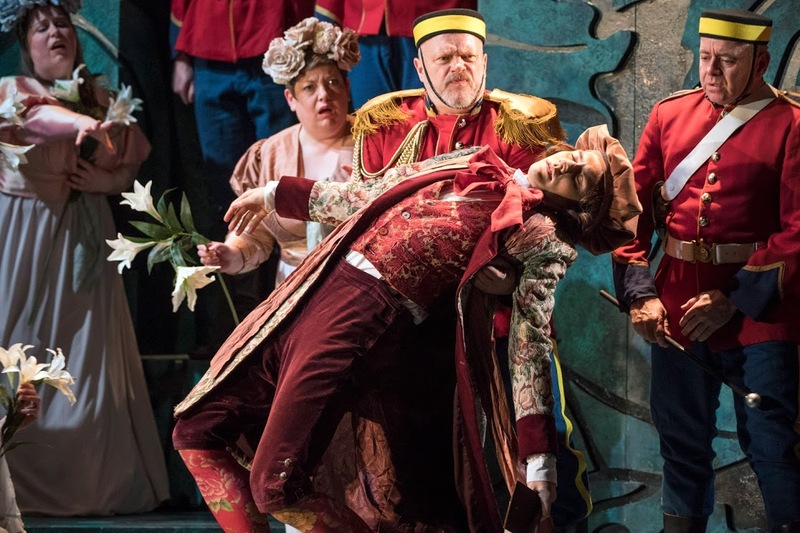 Thankfully this seems to be changing, with productions by English National Opera, Scottish Opera, Opera North not to forget the National Gilbert and Sullivan Opera Company. Now, as part of its Spring 2017 tour, English Touring Opera (ETO) is presenting Patience. We caught the second performance of Patience at the Hackney Empire on Friday 10 March 2017, in a new production directed by Liam Steel, conducted by Timothy Burke with designs by Florence de Mare and lighting by Mark Howland. Lauren Zolezzi was Patience, Bradley Travis was Reginald Bunthorne, Ross Ramgobin was Archibald Grosvenor, Valerie Reid as the Lady Jane, Andrew Slater was Colonel Calverley, Aled Hall was Lieutenant the Duke of Dunstable, with Suzanne Fischer, Gaynor Keeble, and Jan Capinski. The opera was performed in a new critical edition by Andrew Griffiths. 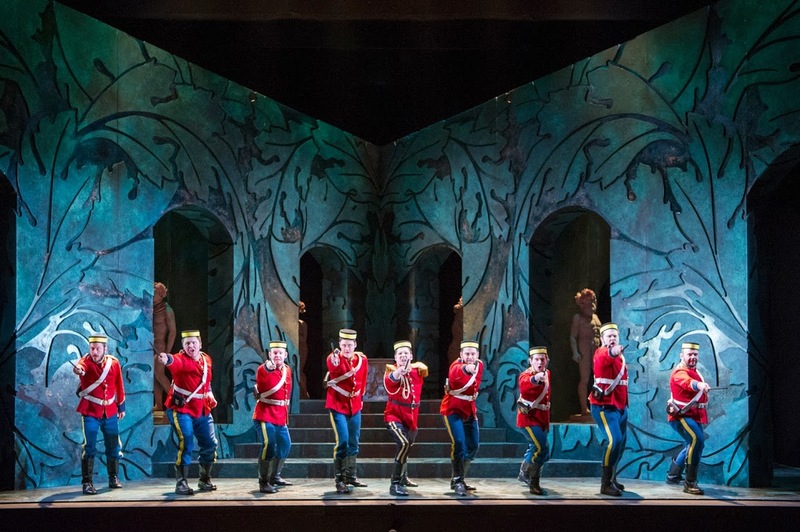 Liam Steele's production had the virtue of taking the opera seriously, allowing Gilbert's twin targets for satire, the aesthetic movement and the macho posturing of the Dragoon Guards, to make themselves felt in a highly effective setting by Florence de Mare which had great fun with the styles and colours of the period. That Steele is a choreographer too was a great advantage, this production folded choreography and physical movement into the mix in a way which felt integral to the performance rather than added on. For a company like English Touring Opera, Gilbert and Sullivan's operas have a number of great advantages, the orchestra does not need significant reduction, there are a number of roles which are ideal for young voices, and a plethora of character roles for older singers. Also, the operas showcase the chorus in a wonderful way. 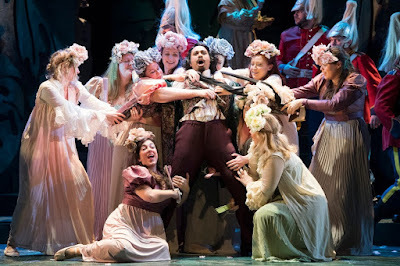 Here, the seventeen strong ETO Ensemble was on superb form producing much vibrantly characterful singing, admirable words, a great sense of comedy, and a wonderful willingness to send themselves up (Florence de Mare's costumes were definitely not flattering to the fuller figures in both men and women, to great effect). All concerned got the words over superbly; we had surtitles for the music but not the dialogue and none were really needed. The dialogue went very well, given in a slightly arch rather stylised manner. All spoke in cut-glass accents, quite deliberately; as with most Gilbert plots, the characters are frequently middle and upper class people playing at being something else. 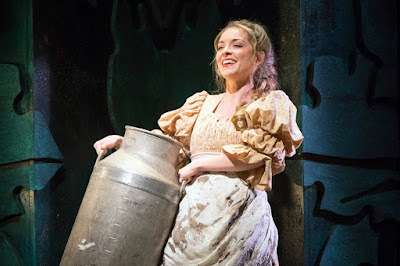 Lauren Zolezzi was a complete delight as Patience, singing with bright focus and great charm, her performance was rather winning and musical too. She managed to create a slightly knowing performance without being too arch, and moments like her Act Two solo 'Love is a plaintive song' had a beautiful simplicity. I loved the running gag whereby Patience, a milk maid, was shown to be far stronger at managing heavy objects than anyone else. Patience has two suitors, the aesthetic poets Reginald Bunthorne (Bradley Travis) and Ross Ramgobin (Archibald Grosvenor). Both had the measure of the combination of words and music necessary to make these roles work. Travis really worked Liam Steele's physical theatre approach to great effect, and showed great comic timing in moments like his confessional monologue 'Am I alone and unobserved?". Whilst Ramgobin had a lovely supercilious air, conscious of his great beauty. The engine of the piece is the rivalry of the two, which worked well here. 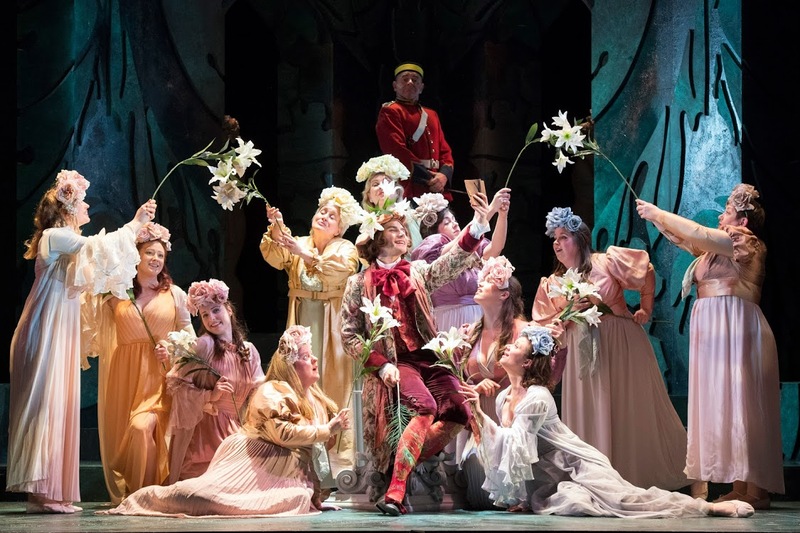 The three aesthetic ladies (rapturous maidens), Lady Jane (Valerie Reid), Lady Saphir (Suzanne Fischer) and Gaynor Keeble (Lady Angela) form a sort of semi-chorus, with each providing a nicely differentiated character in her solo moments. The standard G&S trope of the 'elderly' contralto in unsuitable situations (Lady Jane is still vividly in love with the much younger Bunthorne) remains one of the operas' biggest modern stumbling blocks. At the recent ENO performance of The Pirates of Penance, Lucy Schaufer successfully reinvented Ruth. For ETO Valerie Reid made Lady Jane's solo, with double bass obbligato (! ), 'Sad is that woman's lot' dignified, rather moving and gently regretful when it can sometimes veer towards the cruel. The three men, Colonel Calverly (Andrew Slater), Major Murgatroyd (Jan Capinski) and Lieutenatn the Duke of Dunstable (Aled Hall) were equally characterful. Slater gave his patter song with superb relish, really spitting out the words, and all three performed with great relish. This was particularly true in the wonderful scene in Act Two when the military men turn aesthetic to attract the women, and Slater, Capinski and Hall made it a moment of high comedy. As I have said, the chorus were on superb form and they were ably supported by Timothy Burke and the ETO Orchestra. Sullivan's orchestrations were always designed to facilitate the audibility of the words. But this does not mean that they play themselves, Burke and the orchestra gave us crisp wit and some lovely lyricism. Patience is not one of the G&S operas which is sure fire, it needs careful pointing. I have extremely fond memories of past performances which I experienced, notably Derek Hammond Stroud as Bunthorne in ENO's production at the London Coliseum in the early 1980s. 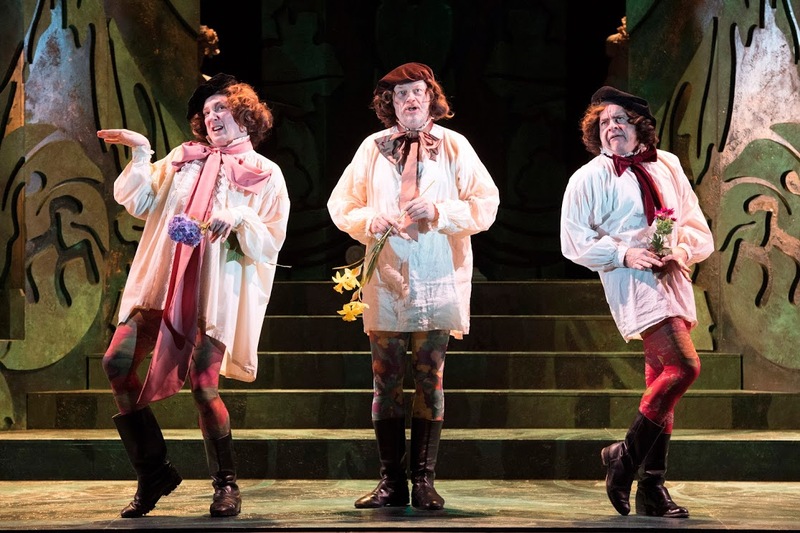 Liam Steel, Timothy Burke and the ensemble made Patience sparkle, keeping the long exposition of Act One moving and showing that in the right hands the opera works well today without radical re-invention. Can we have Princess Ida next please? During the next three months the company is giving nearly 60 performances of its main stage operas (Tosca and Patience) at 22 theatres, the hard working members of the company doubling up so that Andrew Slater is performing Colonel Calverly and Scarpia, Aled Hall performing the Duke of Dunstable and Spoletta with many of the members of the ensemble providing smaller roles, as well as participating in the new family opera, Russell Hepplewhite's Silver Electra, and new opera for children with special educational needs, Different, both of which tour during the same period. And the company continues to have an admirable range, this autumn Handel's Giulio Cesare and Rameau's Dardanus are planned, and further ahead we can look forward to Puccini's Il tabarro and Gianni Schicch, Mozart's The Marriage of Figaro, Handel's Radamisto, Purcell's Dido and Aeneas and Carissimi's Jonas, plans for Verdi's Macbeth, Mozart's Idomeneo and Rossini's Ermione in the pipeline. Visit the company's Support ETO pages to learn how to support its work.